Here’s a quick tip to help the folks with the smoothness of their PLM 360 operations. I have coded a few databases in my time, and tend towards the automated progression of steps, where the parent generates new child forms. For example, when filling out a new client in the ‘client’ field, if the name entered does not exist, the ‘Add New Client’ form appears with the name added already, and all you have to do is fill in the remaining information. When saved, the database updates and completes the link. PLM 360 does not have this workflow built in…at least not yet. You should not have to leave a parent and create a child, and then attach the two; absolutely not. I know this has been mentioned to the PLM 360 team, and I suspect we will see this sort of functionality sorted out very soon. However, until that time comes, I’ll offer you a workaround to help smooth things out. 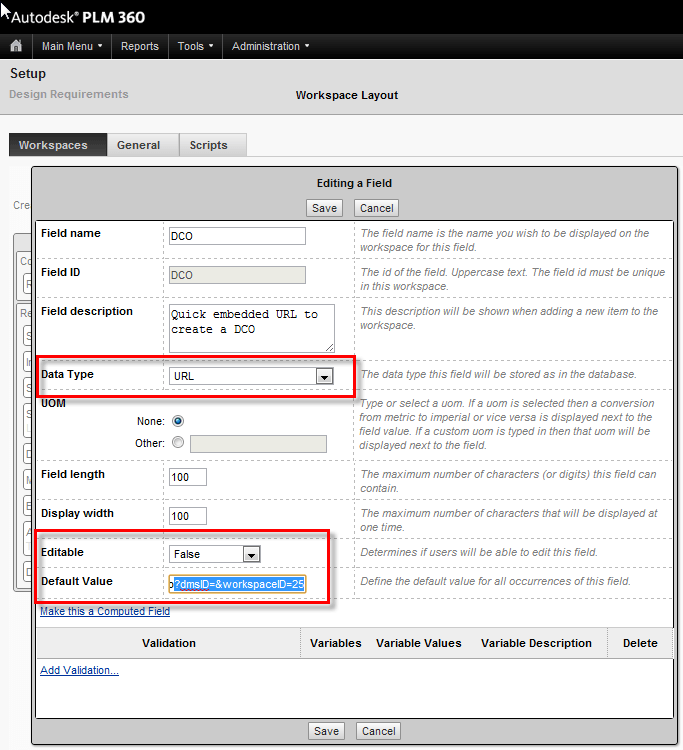 To speed up workspace flow I added a link in the parent ‘Item Details’ as a locked URL field. Here, I’ll demonstrate my Requirements form that immediately takes me to a new Document Change Order with the push of a button. You can use this in any workspace ‘Item Details’ area that you like. Create a field that has a Data Type of URL. Give it a fair amount of length (if you don’t it will error out), set the ‘Editable’ field to False, and add the URL to the Default Field. I simply went to my New Document Change Order and copied the link, and then pasted it in my new ‘Default Value’. When a new Requirement is generated, the un-editable link is added and displayed in the normal viewing mode. 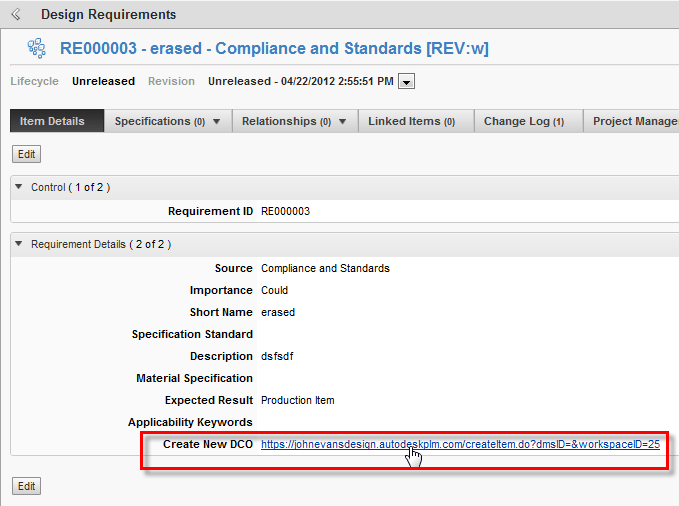 Another benefit is that when creating the DCO, the Requirement you just created is already saved and ready to be linked. Hope this helps. It’s not the greatest solution, but helps me for the time being. Also, you might be able to use scripting as well, because scripts only work once the workspace item has been saved. It would be a bother in my example, but brilliant in some other workspaces. Hmm…. The Five Reasons You Need to be Using AutoCAD Sheet Sets!